Providing you the best range of sofab lp medicines with effective & timely delivery. If you have any questions about Ledipasvir and Sofosbuvir, please talk with your doctor, pharmacist, or other health care provider. 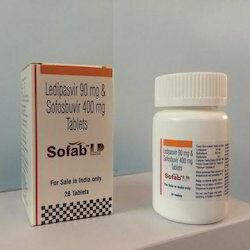 Ledipasvir and Sofosbuvir is to be used only by the patient for whom it is prescribed. Do not share it with other people. This information is a summary only. It does not contain all information about Ledipasvir and Sofosbuvir. If you have questions about the medicine you are taking or would like more information, check with your doctor, pharmacist, or other health care provider.